Welcome back to Tower Site of the Week here at our new home on the remodeled fybush.com! We’re still tweaking the new site, so please bear with us for another week or so as we rebuild the access to 11 years of previous Site of the Week installments, as well as making new features (such as the long-awaited searchable index) available to fybush.com subscribers. It wasn’t hard to decide which site should be the first to be featured here on the new version of Site of the Week: the mighty Blaw-Knox tower at Cincinnati’s WLW (700) was our front-page logo for 11 years at the previous incarnation of fybush.com, it’s still featured on our business cards and pens, and – oh yeah – it’s probably the single most historically significant tower site in the nation. These pictures come from a summer 2010 visit to the site, which has been impressively cleaned up and updated since we first visited in the late 1990s. 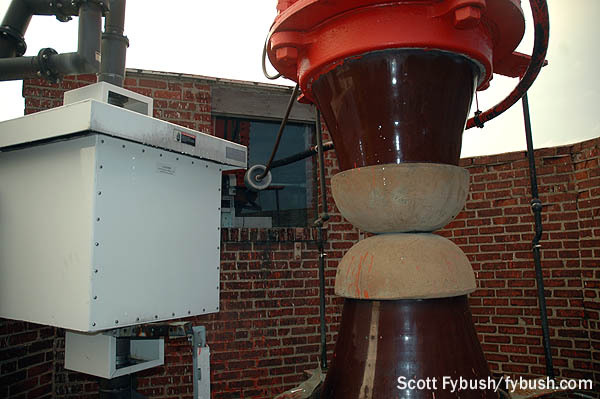 Today, visitors to the site in Mason, Ohio (some 20 miles north of downtown Cincinnati) are greeted by the sight seen above: no fewer than five 50,000-watt transmitters dating back as far as 1928. The 1928 transmitter is the one seen at far left: a Western Electric model 7A. 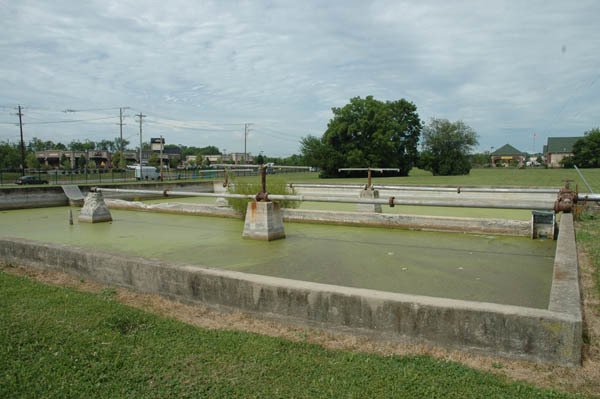 By the time it was put into use here on October 4, 1928, the Mason site had already been in service for several years. It was built in 1925 for another station, WSAI, which boasted of its own “super power” (a whopping 5,000 watts) when it constructed the original house-like building and flat-top antenna here. 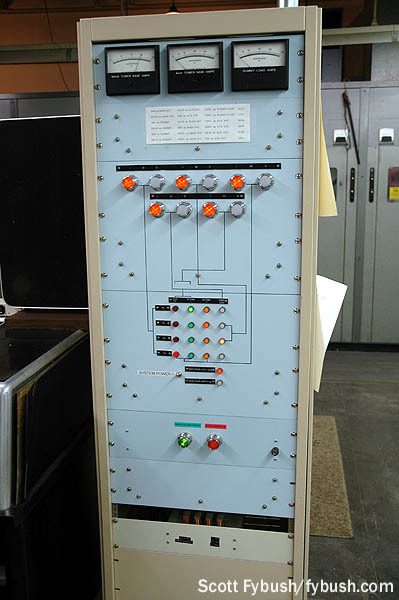 Powel Crosley’s WLW had been operating from its own 5,000-watt “high power” facility in Harrison, Ohio, west of Cincinnati, when it settled on Mason as a superior transmitter location – and so Crosley bought WSAI and began building a new transmitter plant next to the existing WSAI facility. 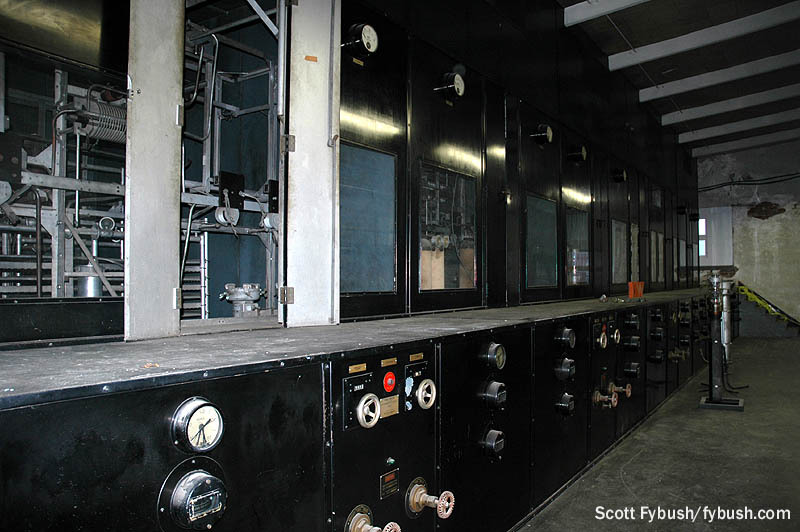 The WLW plant expanded quickly, because Crosley had no intention of stopping at 50,000 watts. By 1932, he’d applied for experimental 500,000-watt power, and construction crews were busy in the spring of 1933 erecting an addition on the back of the transmitter building, a cooling pond out front, two separate 33 kV power feeds from Cincinnati Gas & Electric – and over in the field to the east of the WSAI building, the mighty 831-foot Blaw-Knox tower, one of the first of its kind, boldly labeled with a giant “W L W” sign across its midsection on the side facing Tylersville Road. When we visited last summer, the tower was still supported by its original 1933 guy wires, too, but not for long – last fall, those guys were replaced for the first time in the tower’s history in a nail-biter of a project that had a successful conclusion, thankfully. 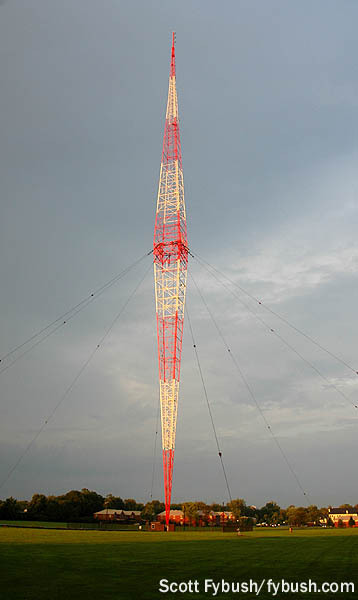 The tower is no longer at its original height: like its close cousin a few hundred miles to the south at WSM in Nashville, it proved to be just a little too long, electrically, for its intended frequency, resulting in skywave/groundwave cancellation that impaired nighttime reception of WLW in important communities such as Columbus, Dayton, Louisville, Lexington and Indianapolis. 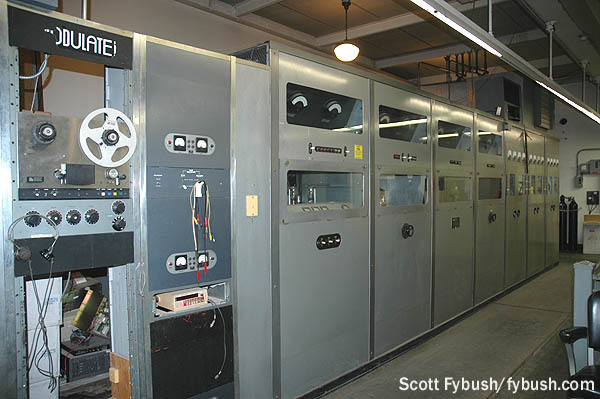 Heading back inside the WLW building, we find a veritable museum of AM broadcast transmission over more than eight decades. 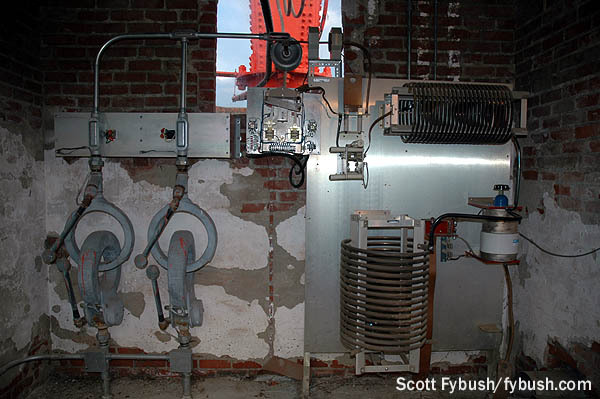 On the left side, as viewed from the front door, WLW’s oldest transmitters line a wall next to the stairwell that goes down to the ground floor: the 1928 Western Electric 7A at left, and next to it the homebrew Crosley “Cathenode” transmitter that once boasted spectacular high-fidelity performance (and a spectacular low-efficiency power bill to match) before being modified in the 1950s into a more conventional plate-modulated transmitter. To the right of the Crosley, along the rear wall, is a Harris DX50 that powered WLW in the 1990s and into the early part of this century before being replaced by a 3DX50 “Destiny” that sits to the far right of the room, in front of the Continental 317C1 that went into service in 1975. 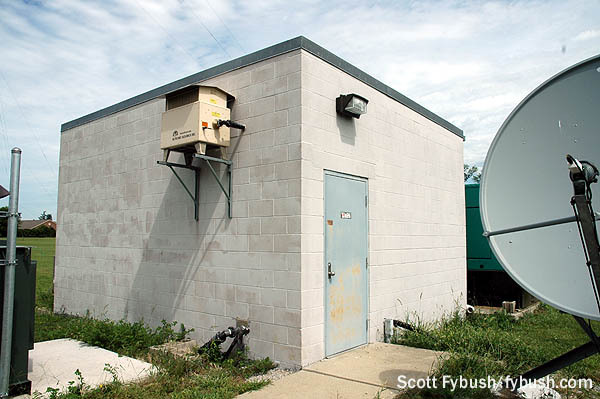 To protect adjacent-channel CFRB in Toronto (then on 690), the FCC ordered WLW to directionalize at night; a passive tower was built in a farmer’s field to the northeast to provide some null toward the Canadian signal when Cincinnati was up and running at full bore. This beast roared its way across the ether for only five years, from its first official sign-on (triggered by a remote control at the White House desk of President Roosevelt) on May 2, 1934 until the FCC declined to renew the superpower authority (under experimental callsign W8XO) at the end of February 1939. While the WLW site isn’t officially open as a museum (and, indeed, still contains a private residence – the old WSAI building next door to the WLW building has been converted into a home that’s been occupied by several generations of WLW engineers), it’s been cleaned up nicely in the last few years and often plays host to visiting engineers, ham radio operators and other interested folks. 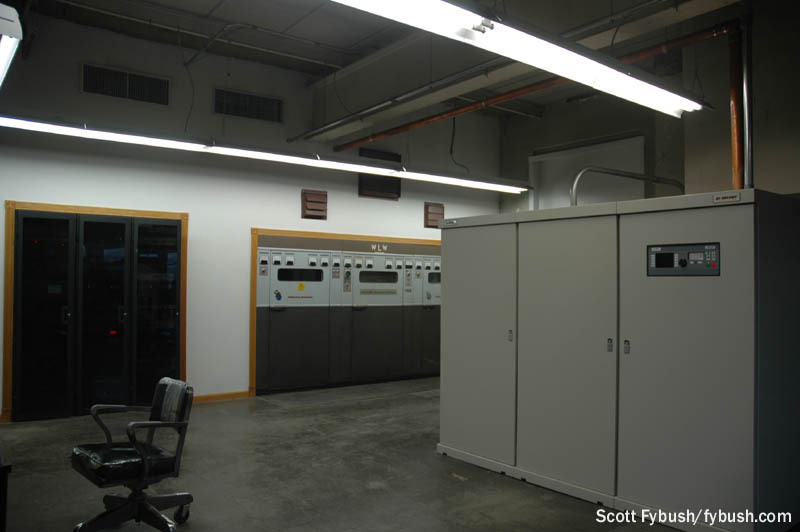 The informal tour today includes not only the transmitter floor but also the basement of the building, which is a magnificent piece of history itself. 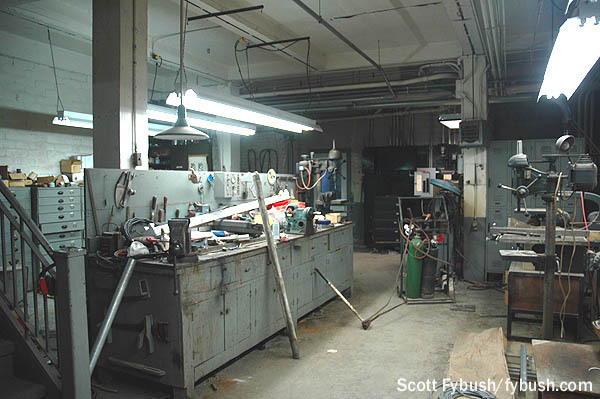 At the bottom of the stairs, a well-equipped workshop allowed many of WLW’s 63 engineers (!) back in the day to fabricate a lot of their own parts. 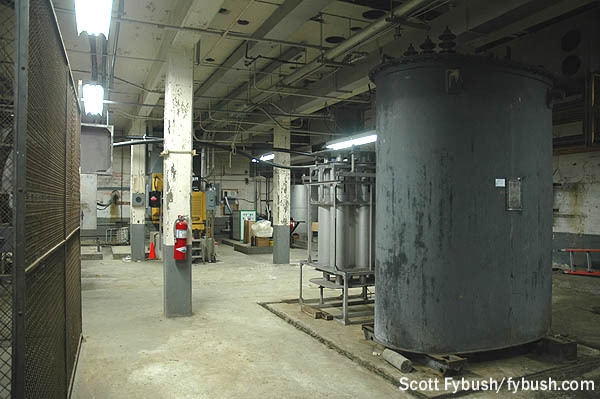 Behind it, a fallout shelter is being rebuilt as a last-ditch emergency studio, and back behind that is perhaps the most awe-inspiring room in the building (which is saying something, considering what’s upstairs): the 40-foot-long vault under the 500 kW transmitter that housed the gargantuan modulation transformers. One was removed (oddly, the one with a blocked path to the outside door! ), but the other still sits here, bearing witness to a day when nobody yet knew just how much power would eventually be the maximum for AM broadcasting in the United States. Thanks to current WLW chief engineer Ted Ryan, his predecessors Paul Jellison and Chris Zerafa, and to Clear Channel’s J.T. Anderton for their insight into the WLW site over the years! 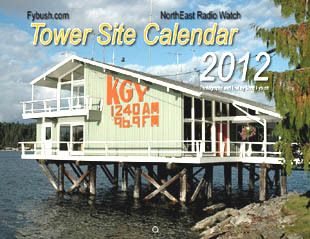 The WLW tower site is one of many you’ll find featured in the all-new Tower Site Calendar 2012, available now from the all new Fybush.com store! 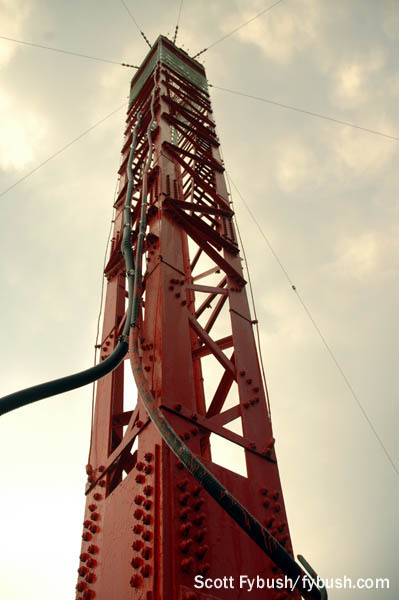 How many of these diamond towers are left? I know there is one at WFEA’s tower site in Merrimack, NH. I’ve been pushing for the inclusion of the WFEA-AM 1370 Manchester, NH towers in the Tower Calendar for some time. You’ve had the KTAR-AM Phoenix, AZ towers TWICE; and the KEVA tower a few months ago couldn’t have been more boring. (Since I can see my Tower Calendar from my breakfast nook, I’m tempted to slumber in my Kashi wheat cereal with only a big mug of coffee to bring me back when I looked at the KEVA picture.) So how about it: WFEA-AM in the 2013 Tower Calendar! I need to get up to Merrimack to get a better WFEA picture…once I do, it’s a lock for a future calendar! WHO in Des Moines once had one as well; the bottom half of that tower still stands and is used at a State Police barracks. WADO in NYC also once sported a B-K diamond tower. WJR had one, but it was destroyed quite early on in a storm. But even as far back as 1935 they were making traditional uniform cross-section guyed towers and self-supporters. As far as WLW, although they no longer had a daytime license for it, they were still apparently using the 500 kW rig during the “experimental period” into the 1940s. (What happened in ’39, I believe, was (a) that the FCC finally specified that the class of license they were using was no longer permitted to operate commercially, and (b) the FCC adopted the new NARBA station classifications.) In 1941 they applied (along with several other stations) for 750 kW, but the FCC hearings into this were canceled shortly after Pearl Harbor. The materials to build such transmitters would not have been available even before 12/7/41 as rationing of aluminum and nickel was already in place in the summer of ’41. I haven’t checked this site in a while, and you have no idea how elated I am too see my home tower first-thing on the revamped page! You do great work Mr. Fybush. Always love checkin’ out what you’ve got posted in the archives! 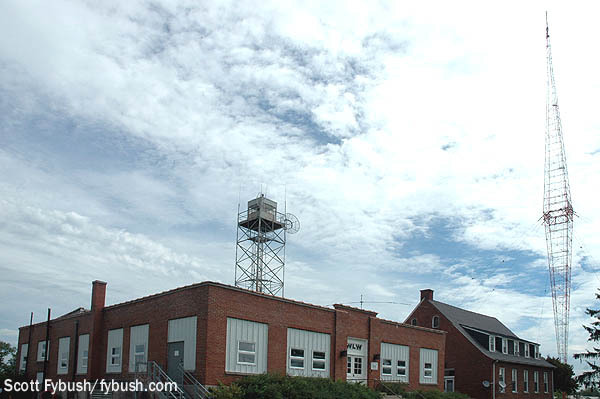 WVWA in Pound Ridge, NY has a Tower just like the WLW one. I live in Charlotte and visit New Hampshire every summer. If you ever need photos of WFEA or WBT let me know. Would be interesting to hear from past Cincinnati broadcasters on this one. I hit The Queen City in 1983 -to the strains of WLW and it’s revamped programming including the promo airing that told listeners to set their first car radio button to WLW. I was joining WKRC (550) and back then the analog (and digital) radios usually were set from left to right. My first real introduction to Cincinnati was our powerful competitor suggesting they de-program MY new station to theirs. Randy Michaels and his crew were the ones who put WKRC on the map-and had gone across the street to WLW and were beginning to make their mark. It seemed that Avco had seen the ratings of the station erode for years and 55KRC was the dominant AM signal with 5kw days and 1k nights (directional). The next 2 years were interesting. With The Cincinnati Reds on WLW they would always win the Spring book. We had The Bengals, so we would usually win the fall. Diaries were wonderful things and so was Taft Broadcasting who didn’t want their flagship to fall to their former managers. In one of the more intelligent moves of my career, I left WKRC when it was on top-only to see it fall in subsequent years at the hands of much more aggressive WLW. (Their signal didn’t hurt either). When I returned (to WKRC) in 1991, it wasn’t long before WLW and Jacor bought ‘KRC. During a 3 week job search, I was asked to host Jim Scott’s show on WLW for 2 weeks while he was on vacation. Morning drive on “The Nation Station”. It was fun, tempered only by the knowledge that when Jim came back, I’d still be unemployed. Then I was asked to fill in on Q102, WKRC’s (soon to be former) FM sister. 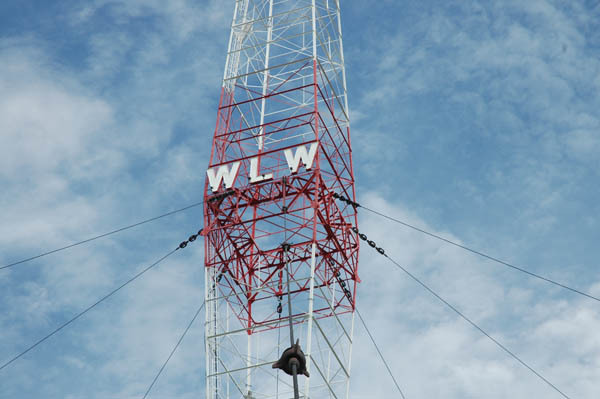 When Jacor took over 550, it became WLW-A . .which could have been a continuation of the TV branding of the 40s and 50s. While doing mornings on Q102, I was asked to fill in on “550WLW” for a couple of weeks on a Saturday morning basis. This was the early days of consolidation and it was strange to go from one floor to another, and from one company’s station to another in the course of 5 minutes. Things have changed a whole lot. When Clear Channel bought our company I found my time being shared with FOUR stations, once competitors, but still legendary call letters. WKRC (550). WCKY (550, 1360 and 1530). WSAI (1530 and 1360), and WLW which is the only one of the four that hasn’t had call letter changes. It’s also still the strongest station in the market. What’s that tell you?